We all have a list of places that we are just dying to go to, but one look at our wallet and those plans seem too far away. A cabin in the Maldives, a cruise by the Danube, a safari to finally see the big 5 in person, even getting spit by a llama in Peru… they may all sound like major bucket list items but out of reach for now. Wait. Before you crawl to your bed and cry in fetal position, let me tell you that November might be the month when your dream trip finally becomes a reality. You probably have heard by now of Black Friday and Cyber Monday and all the craze that creates in the retail world. These dates happen in November every year and might be the solution for finding the greatest deals for your trip. Keep reading to learn exactly how to take advantage of these special offers and finally take that trip. This article is sponsored by Skyscanner. I’ve been using their service since long before, so I’m happy to recommend them, and all opinions are my own. Please, read my Disclosure. November must be THE best month of the year when it comes to making your dream trips come true. Airlines joined the fever of Black Friday and Cyber Monday, and if you miss those, you always have Travel Tuesday. Black Friday is always the day after Thanksgiving. Many airlines and other companies offer huge discounts on their products on this day. Cyber Monday is the immediate next Monday after Black Friday. The deals continue during this Monday. Travel Tuesday is a trend followed by many companies in the travel industry, especially airlines, where they offer great discounts if you purchase on Tuesday or travel on Tuesday. This trend started because is common to see that the tickets are usually cheaper on Tuesday. There are lots of options to choose from, but I’m going to explain how to use one of my favorites: Skyscanner. Skyscanner is a flight search engine that, in regular days, looks for the best flights available, allowing you to save money in the process. During Black Friday, Cyber Monday and Travel Tuesday, they take their usual awesomeness up a notch and help you find the best airfare deals across the web. These days have now become the cheapest days to buy airplane tickets. If you want proof, here’s a graph with their stats on ticket prices throughout November last year. As you can see, the prices of international flights are significantly lower during these days of special offers, a fact that can help you finally book the trip you’ve wanted. Also, I always compare their prices with what it costs to buy directly from the airline website. Almost always is a lot cheaper to buy from Skyscanner. First, think about the trip you want to take. Have you thought of a specific place you want to go and a date, or are you flexible with your plans? The more flexible you can be, the more chances you have to get better deals. Whether your plans are flexible or not, keep reading to find out how to find the best flights in your case. 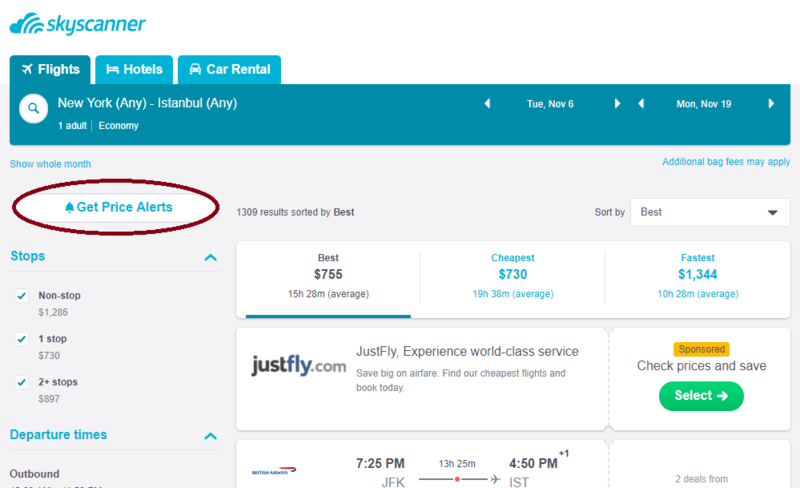 Skyscanner allows you to search flight prices all around the world. They are ordered by price, so you can easily discover great deals to destinations you didn’t even think about before. As seen in the picture above, just enter the city where you are flying from, and click on “To”. A message will appear suggesting to search “Everywhere”. Click on it and continue to define your dates. If you are comfortable adapting your flight dates, you can look for the cheapest days to fly too. Skyscanner makes a quick analysis of the prices during the next year and shows you the average cheapest month. As in the picture above, click on the “Depart” section and choose “Whole Month”, and “Cheapest Month”. You can do the same for your return date. If you know your destination and dates, find out when prices drop with an alarm. Setting up an alarm on Skyscanner will allow you to receive a notification every time your dream destination has cheaper flights. You just need to enter your wished itinerary and go to the search results. On this page, click on “Get price alerts” as seen on the image above. Every time the prices drop, you’ll get an email notifying you of the change. Now that you know how to find the best flights, it’s time to take advantage of Black Friday and Cyber Monday. During the month, set up alerts and log in on Skyscanner on the days of special offers. Also, check out the flight deals that Skyscanner has collected for Black Friday and Cyber Monday. These last two pages have lists of amazing airfare deals and predictions so you can get prepared. Also, you never know what you will be up to during these days and it can be difficult for you to log in your desktop. To be sure you don’t miss the opportunity, download the Skyscanner app. With the app, you can book the best flights on the go. Where are you planning to go? Let me know in the comments below if you try this method to find your next flight!